Sept 21 Yesterday was a hard day and I feel it today. The effort put into the new website is unbelievable. This is new ground for me and while it goes three steps forward and two steps backward, it actually feels like 2 steps forward and three steps backward. My goal had been to have it up and running last night. It didn't work out as planned, but we shall see what the day brings. 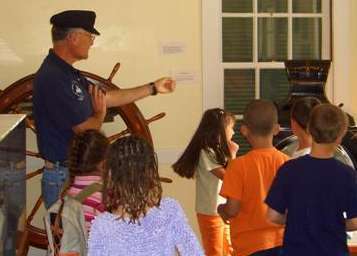 Before that though, we have a full day of lighthouse tours including a school tour of 36 first through sixth graders. Let us hope that the force is with us to say the least. Breakfast was oatmeal, but unfortunately, without fresh fruit. Linda opted for vanilla yogurt on hers while I got out some of our dried dated. She forewarned me the dates would have been a lot better cooked with the oatmeal, something she remembered about the time it was just about finished cooking. As I was to find out, that would have most definitely have made it better, lol. It might also have been good to reflect on the situation for a moment, dwelling on the possibility that it might have been a harbinger of the rest of my day, smile. I did spend a little time on trying to get the website to work, but luck was not with we. When you don't know for sure what your doing, luck certainly plays a part in the out come of your endeavors. All too soon it was show time as they say and it was time to start our work day. We went over early since the kids were supposed to arrive at 10 o'clock. Soon Gaylyn, Steve and I were standing in front of the lighthouse waiting for the school bus to arrive. After waiting about 15 minutes, Shirley walked up to let us know the man in charge had stopped by the museum to let us know the group was going to be a little late. When they questioned him on just how late he confessed they were supposed to have already have been here and he wasn't sure when they would arrive. Gaylyn smiled and said it what always happens with large groups. The show up between 30 and 45 minutes late. Doesn't matter if it's at the start of the day or the end. This group fit the mold perfectly as they arrived 40 minutes late. With kids everywhere, they were lined up into groups. I had chosen the first and second graders, which actually turned out to be a great bunch of kids. We were the group that started in the lighthouse and the kids had fun climbing the stairs. The light meant nothing to them, but everything else did. I soon discovered that allowing them to go over to the telescope after they looked at the light kept three of them occupied. The one on the stairs looking at the light, the one looking at the telescope and the third one waiting to climb the steps to the light. For once luck was on my side. After touring the lighthouse, we went down by the Coast Guard life saving boat. They had a great time looking at it as the photo shows. Next we went into the museum, a "Do Not Touch" area if there ever was one. It was fun watching and talking to them. There was one little girl who could not keep her hands to herself. There were three mothers along with the group of kids and try as they might, they couldn't corral her. Finally they just ignored her and she soon stopped. Then she discovered if she touched things in front of the other little girls, they would try to stop her, so it set her off again. Just one of little incidents that make up life, smile. I must admit I did enjoy the kids and their curiosity, but a little bit goes a long ways. It also appeared the kids enjoyed it also. After that it took me several adult tours get back into the swing of things. 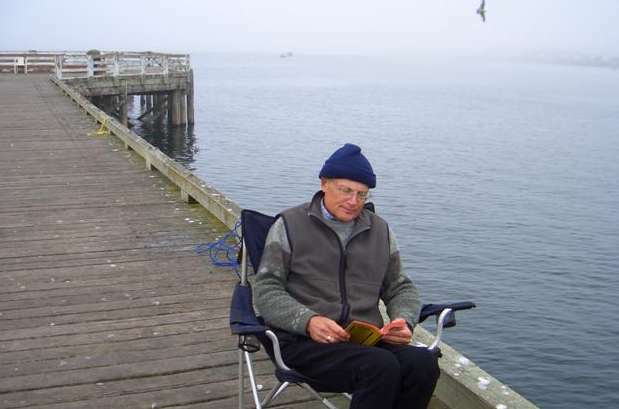 I had two really good groups where there were people along who were highly knowledgeable about lighthouses. I thrive on their questions and comments. To be told by someone that they have been to every lighthouse on the Washington and Oregon, and this was the best tour and I was the best tour guide they ever had, just makes my day. Soon it was quitting time. The 50 amp extension cord had been delivered by UPS, so I lugged it over to the coach. Those things are really heavy. Dinner was broccoli, butternut squash, tossed salad and leftover meatloaf, a perfect meal for the way I was feeling, completely worn out. Not from the tours, but from working on the website. That was also what I tackled as soon as we got back to the coach and by early evening had it up on the server and running. It still has some glitches, one of which seems to be a sizing issue in Microsoft Internet Explorer. No wonder so many people bad mouth it, lol. We ended the day with another bowl of ice cream and a chocolate zucchini brownie. Talk about good. Once we learned to eat right and our taste buds got cleaned up so to speak, it's amazing what we enjoy. Sept 22 Our third day in row at the lighthouse, but it should be fun. What has not been fun is getting this new website to work the way I want it too, lol. There are some things I want it to do that is baulking at doing. That I have come a long ways in the months since we stopped working at a "regular job" is readily apparent in the fact I can accept its idiosyncrasies and let it be. It is okay if it's not exactly like I want it to be. According to Linda that means I have come a long, long way. I think she's right. Breakfast was oatmeal, but with a Granny Smith apple cut into bite size pieces, coated with cinnamon and microwaved for 3 minutes. It was different. It was good. We will definitely have it again The variations Linda can come with just boggle my mind. We laugh at what we eat, knowing most people would probably not consider this to be something they would want for a meal. Every time we step on the scale and have the same number staring at us that we did when we were 21 years old, plus having the energy we had at that age, we know we are doing something right, smile. All to soon it was time to walk over to the museum and leave my attempts at web page implementation behind. Since I wasn't accomplishing anything, it was probably the best thing I could do, lol. There was another bus load of school kids coming this morning. They were supposed to arrive at 10:30 which meant no regular tours this morning. Gaylyn suggested that we could run a tour if we stared in the lighthouse and worked backwards, so at 10:15 I was in the lighthouse with three people. The timing worked out great as we were just finishing up when the bus with the kids arrived. That meant hard duty for Linda, as she had to tell all our visitors that we would not be giving any tours until after 12:00. 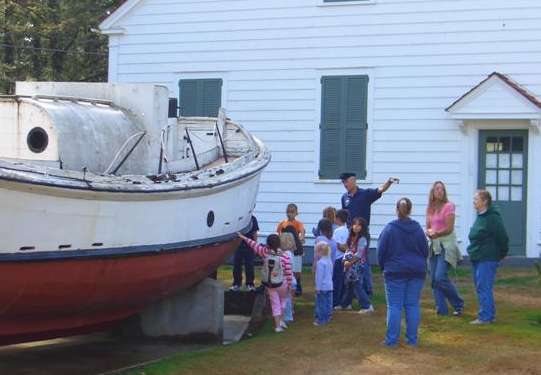 I did museum duty while Gaylyn, Jim, Liz, Steve and Shirley did lighthouse duty. I got all the display cases cleaned with Windex, plus answered a lot of questions from our visitors. We had quite a few people waiting when we could start tours again, with 15 going on the first one. This is too many people, but since we were in a situation beyond our control, as the saying goes, the show went on. By now I have learned that the larger the group, the longer the time spent in the lighthouse. It takes time to get all those people up and down the stairs. 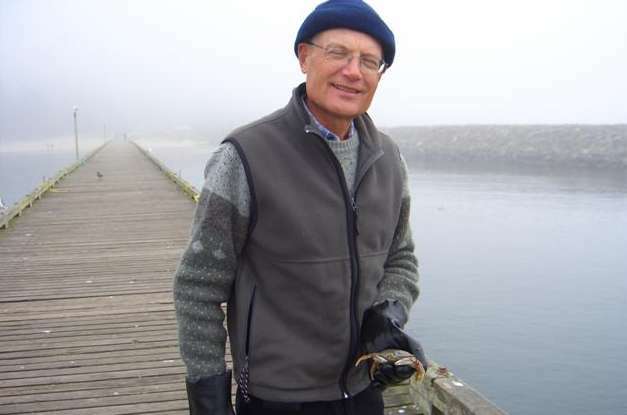 Besides, I just wasn't pumped, but as luck would have it, several of the people on the tour were quite knowledgeable about lighthouses, so Bob quickly shifted into fine form, lol.The day simply flew by, though we did have one very special surprise. Unbeknownst to us, two of our friends were passing through town on their vacation. What a wonderful surprise when i looked up and saw Wayne and Linda. In short order it was hugs and laughs all around. I'm sure some of the other guests wondered who those crazy people were, lol. It was one tour after the other, with a few swallows of water between them, Lunch was 8 grapes, the turkey wrap remaining in the refrigerator. Timing wise it worked out great when the last tour departed at 3:30, allowing us to lock up the museum before 4:30. 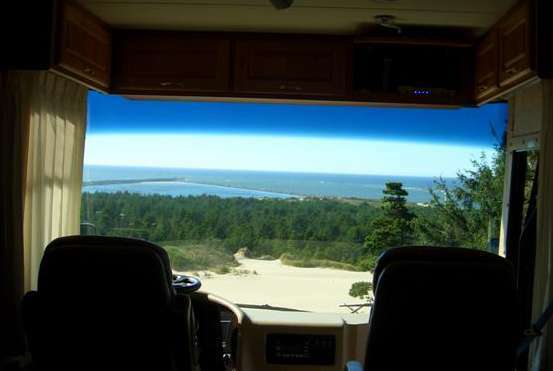 We relaxed by the coach eating peanuts and watching for whales. Unfortunately the ocean was really acting up and we didn't see any spouts. Dinner was spaghetti, eggplant and tossed salad. 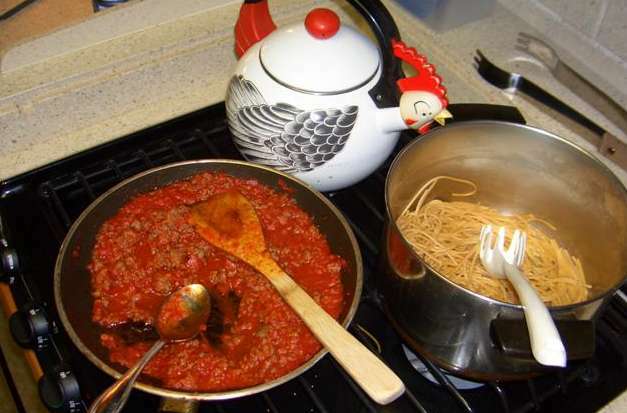 Linda made the spaghetti sauce with Bob Evans sausage, which rated a double wow. Watching TV while trying to work on the website followed. Then came the time for dessert. For the third straight night we had fat free, sugar free ice cream and chocolate zuchinni brownies. Deciding that enough is a enough when it comes to trying to figure out to get the "impossible to post" picture to post, we called it a day. Sept 23 What did Casey say? "It's deja vu all over again", or something like that. It is Saturday and consequently we don't have to work. We get the weekend off and the weekend off and the weekend off, lol. That's my take on the deja vu way of saying we have the next 6 days off. Back when we had regular jobs weekends went by so fast it seemed like Monday morning followed Friday night. Don't think we are going to have that problem this week. Early morning was taken up with tweaking the website. I've got a couple of things I want it to do that are giving me trouble, actually, fits is more like it, but as Linda has observed so many times over the years, I will work at it until I figure out how to do it. I really do believe in that old Chinese proverb, "Give a man a fish and you feed him for a day. Teach a man to fish and you feed him for a lifetime." Curiosity is something I have in bucket fulls. Show me the result and I will try to figure out "the how" that led to that result. Back to the subject, I also posted some more journal entries as I am not only trying to keep current, I am also trying to fill in the missing blanks, smile. Eventually the distaff side of our journey through life made her appearance and shortly after we were enjoying a breakfast of scrambled eggs and onions, Canadian Bacon and grapes. No picture once again, but do I have a reason for the lack of photo's. During our adventure I have carried the camera all the time. The little case that fastened to to my belt made it easy. But a few days ago the Velcro strips that held it closed decided that they had reached the end of their life. First thing I know it flew out when I bent over (at the crab pier), and until we get it replaced it is no longer at my side all day long. I could just imagine it falling out at the topof the lighthouse and being camera parts by the time it got to the bottom. When we arrived here we had backed into this site. That made it easy to park and also to move if we needed to when Ray and Virginia left. Now with Jim and Liz here, it was time to give us a room with a view, so to speak. Now big picture windows are great, but bug specked big picture windows aren't, smile. 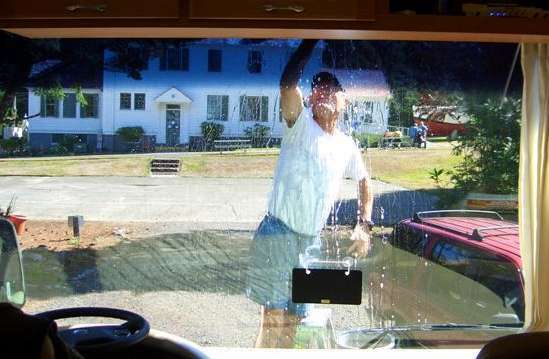 I was soon busily engaged in washing our picture window. This was a job that had to be done before turning around due to the steep bank that would be in front of the coach once it was facing the Pacific. One good thing was, the weather had turned warm, so it was shorts time. As you can see, I was the one who did the washing while Linda did the inspecting. Then it came time to turn the coach around. It is things like this that test the bonds that hold people together. 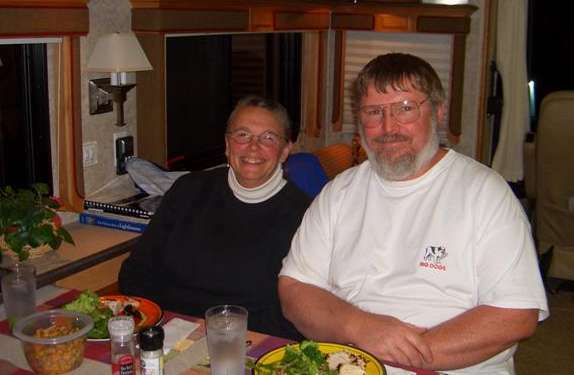 After a great deal of maneuvering and discussion, some of it shall we say, heated, the coach was parked in the perfect position that Linda wanted and leveled to her satisfaction, smile. Of course it immediately called for a photo, the original of which is already up on the home page. We immediately turned on the MotoSat and it quickly found the satellite, so we went ahead with all the hookups. It had been easy when we were backed in, as all the connections had been at the drivers side rear of the coach. Now all the utility connectuions were at the front passengers side. That was why we had ordered the 50 amp extension cord. Also the SaniCon pump out system makes for an easy hookup to dump the gray and black water tanks. Lunch, just the subject to talk about after the black tank, lol, was smoked turkey wraps, pita chips and grapes. The question is sometimes posed to us, don't you ever get tired of eating the same thing for lunch every day. The answer is no, because it is not the the same thing. The wraps are often different, our only criteria is that they be very low fat, high fiber and have no sugar. Same goes for the meat, but it is usually turkey because of the low fat requirement, besides we absolutely love smoked turkey. Any condiments need to be fat and sugar free, but otherwise they can be whatever, it's just that we use them in moderation. The veggies can be whatever. After all, it's the variety that makes them good. After lunch I went to put the cleaning equipment away and discovered we still had some soapy water in the bucket. Now we have a bright shiny back end as well as front end. The only problem with this was I still hadn't used all the soapy water. The Explorer came to the rescue, lol. Sure hope Linda doesn't think I'm going to take on all these domestic responsibilities for the future. We laughed as we recalled the last time the Explorer had been fully washed was when we had been in Nebraska of all places. Lots of miles and states since then and no one had ever told us it looked dirty. Of course Linda was quick to point out that's not the way it works. Following this it was more computer time, then dinner. Linda made the remark that she sure liked fixing this dinner. 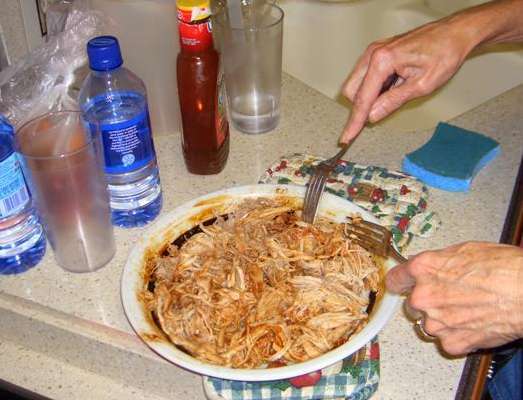 Get out the containers of barbecued shredded pork loin, sweet potato salad, cole slaw and baked beans. Pop the beans and pork into the microwave and dinner was ready. Cleanup was putting the containers back into the refrigerator, tossing the paper plates and washing some silverware.She could make it even easier if she could get me to do the microwave part, but I'll let her think she cooked dinner, lol. Part of the reason for the quick dinner was so we could go crabbing. Though it didn't turn out to be the best night, we did get two keepers. We always had a good many in the traps when I hauled them up, but unfortunately they were either too small, or if they were big, they were females. Oh well there is always tomorrow night. I cleaned them and we cooked them after returning to the coach, which was followed by the last of the chocolate zucchini brownies and ice cream. 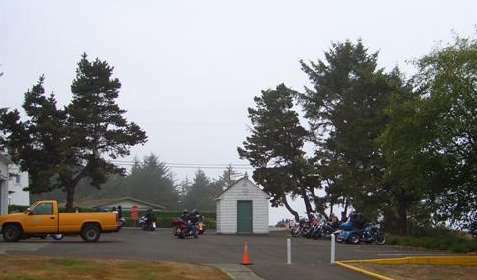 But don't fear, we are going over to Reedsport tomorrow so there will once again be fat free, sugar free ice cream in the freezer. Sept 24 Sunday, Sunday, oh what a beautiful day. This was our first morning awakening to the new "view to the front". To say it doesn't get much better than this is an understatement. In fact it was so neat that Linda almost spent too much time looking out at the ocean and the fishing boats rather than fixing breakfast.. Plus, we can also watch them harvesting the oysters in the triangle, but that's a story for another day.Breakfast was definitely different, or maybe I should say similarly different, smile. It was oatmeal cooked with chopped dried dates, something that is going to take a little getting used to, double smile. This was one time my mind conspired to confuse me. The other day I had put a handful of the same dates on cooked oatmeal and found it to be good. However I thought it would be better if the were added to the oatmeal before it was cooked. Turned out to be not so on the first attempt. Maybe it's one of those getting used to things, or maybe it will just be an emergency breakfast thing. Sunday also gave us the opportunity to try out a new church. Browsing the Internet we had found the website for the local Presbyterian Church included a comment about a more informal service the last Sunday of the month, so, being life long Presbyterians we decided to go. We had hoped for a more contemporary type of service but that was not the case. After we were seated in the sanctuary, we both looked around and had the same thought. We were two of the youngest people here. Then we looked at the bulletin. It was the typical Presbyterian order of worship plus a lot of songs that we did not recognize. We decided informal meant the minister and choir were not dressed in robes. And they wonder why church denominations like this are slowly dying. Yet, literally, right down the street is the church we had gone to for the last few Sunday, the Reedsport Church of God that we found uplifting and vibrant. I do have to say that while the architecture of this church building was a treat to the eye, this adventure has opened our eyes in more ways than one, smile. When church was over we left as quickly as possible, which was not quickly at all due to several elderly women with walkers who were in front of us. We were also handed a little "goody bag" to welcome us and also identify us to everyone as "visitors". Our plan for the day included attending the Tsalilia festival in town. 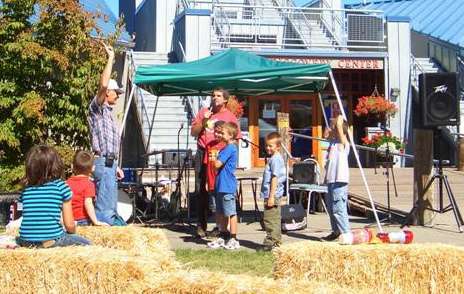 This local celebration of the river and its salmon, pronounced Sa-Lee-La, is held at the Umpqua River and Discovery Center. 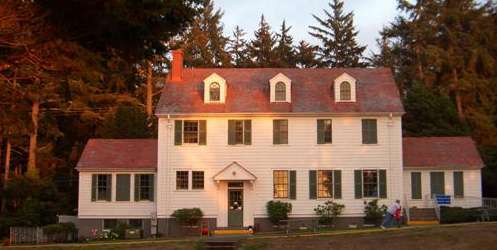 It includes a complete traditional Indian village set up with tribal drumming, dancing, storytelling, plus demonstrations of flintknapping and other native crafts by the Confederated Tribes of Siuslaw, Coos & Lower Umpqua Indians. Topping it off was a traditional alder-cooked salmon meal. At least that was what the information we read about it said. We were surprised at how few people were in attendance. Then we ran into the minister and another couple from the Presbyterian Church and found out Saturday is the traditional big day when all the out of towner's attend. Sunday is more of a locals day. As we walked away we decided we were locals, lol. We toured the exhibits, buying some votive candles made from palm wax. Now during those winter evening meals the coach will be filled with the scent of tangerine, honey or jasmine. Later we sat and listened to story telling. The tale was about a king who became trapped in a bubble. The story teller was using some of the kids in the audience to act out the characters, unfortunately he could find no one to play the prince. Finally he got a volunteer and the story concluded with the prince saving the king. 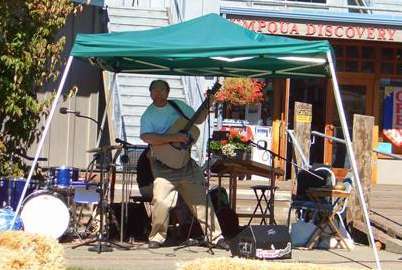 Following the story telling, Joe Ross performed a number of Irish ditty's. We laughed and laughed as he put on a great performance. He did a truly great job with "Paddy and the bricks" and "What the Scotsman wears under his kilt". Leaving the waterfront we drove up the Smith River to our blackberry picking spot. As we followed the road winding along the river we noticed an inordinately large number of vehicles parked alongside the road. Didn't take long to figure out that Sunday afternoon is prime blackberry picking time around here. Our spot had been pretty well picked out, but in short order we had about three quarts, enough for breakfast each morning for the next week. 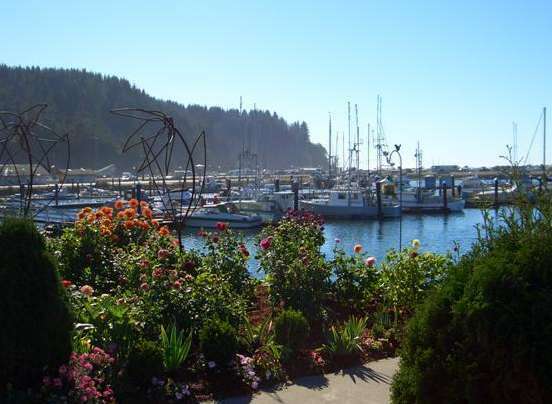 We ate our turkey wraps for lunch along the Winchester Bay waterfront while we talked to our kids on the cell phone. The more time we spend around around the water, the more we understand why people are drawn to the ocean. We have always been mountain people, so this is a major change for us. Who says you can't teach old dogs new tricks, lol. Then followed more computer time, during which Linda baked another chocolate zucchini cake, which eventually merged into dinner. It turned out to be identical to last nights except for the absence of cole slaw. We had eaten all of the slaw last night and tonight found out it had really added something to the meal. Oh well, barbecued pork, sweet potato salad and baked beans still made a delicious meal. Then it was time to go crabbing. Once again we arrived shortly before dusk to find very few people there. 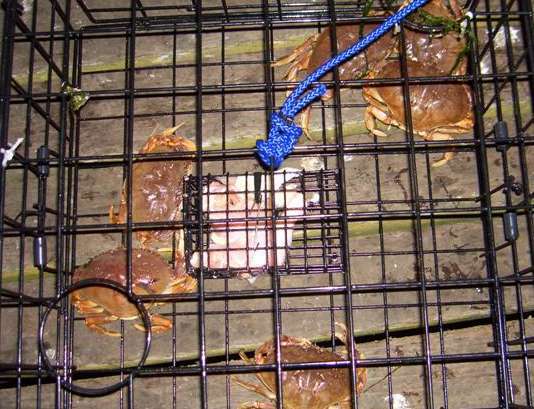 We also found very few crabs, actually bringing up empty nets on occasion. We left early with no crab. I've come up with a new theory about the best time to go crabbing which we will try out. At the worst, we can do no worse than tonight, lol. Dessert was the fresh baked cake and ice cream. I must admit to the error of calling it chocolate zucchini brownie in some of the past daily journal articles. Different name but same great taste, lol. Our life was a true joy today. Sept 25 Monday morning and yesterday's journal is already posted. I love this new website, smile You'd never have to guess what was for breakfast if you'd have seen the big bowl of ripe blackberries in the refrigerator. No sooner was Linda up than the oatmeal was bubbling in the pot. Soon there were two bowls of hot oatmeal smothered in plump ripe blackberries setting on the counter. 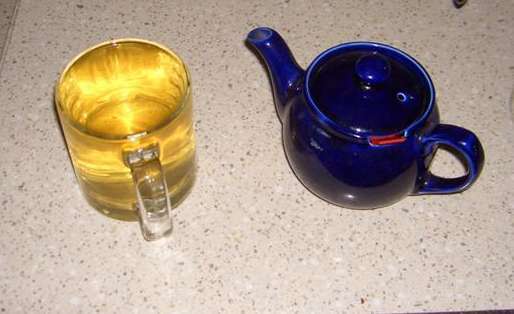 Talk about the best way to start the day, you've got to go some to do better than this. Linda then made lunch, turkey wraps of course, and we headed off towards Coos Bay for some quality shopping time together. Our first stop was at the Hospice Thrift Store. Linda has been selling some things on Ebay and she wanted to see if she could pick up any more items for that purpose. She found a few odds and ends that looked promising, while I browsed the books. Looks like she is going to test the market for some 1940's era sheet music. I on the other hand would have to be content with the reading material already on hand, as I found nothing of lasting interest. Our next stop was a second Ebay buying opportunity, the North Bend Goodwill Store. Here we reversed the results obtained at the Hospice store. Linda came up empty handed, while I wakled out with two books. I haven't figured out whether it is good or bad that we don't even have to ask for the senior discount anymore, we just automatically get it. I can understand why when they look at me, but a mere child like Linda, what do they see that I don't, lol. By now it was getting long past lunch time, after all we had spent more than three hours shopping at just these two stores, so as we pulled into the parking lot of the Walmart Supercenter we decided to eat. With the windows down, a breeze made it quite comfortable, just as the turkey wraps, black grapes and prune plums made for a marvelous meal. Sitting there we talked about Walmart. One interesting thing we have discovered is that the people who live like we do seem to love Walmart, while the ones that badmouth Walmart live in a house. Not a criticism, just and observation. We like to shop at Walmart for a number of reasons, not the least of which is that we can find things there. The peanuts in the store in Victoria, Texas are going to be in the same spot as in the store in Coos Bay, Oregon, plus it's going to be the same brand. This extends to most things in the store. We have also shopped at enough grocery stores all over the country to know that the quality of produce in Walmart is better than virtually every local store. Anyone who has followed us for any length of time knows we try to eat a very healthy diet. Walmart has the types of food we eat, the local stores can be very hit and miss. Remember, most of our time is spent outside the major urban areas which also makes a major difference. All this doesn't mean we don't shop at Krogers, Food Lion, Albertsons, Publix, etc when the opportunity presents itself, it's just that we find Walmart to be another excellent choice to shop at. Shopping in large stores can always be fraught with danger. The danger of the impulse purchase. Linda's method of corralling me is to have a list with everything we need circled, then the one or two items not on the list are written down. I admit we have a rather limited list of items, i.e., no corn products, no cookies, chips or pop tarts, no canned veggies or fruit, no sodas or beer, no pineapple or other tropical fruits, plus, no prepared or heat and eat foods. A list which probably includes most all of the items found in a grocery store. In fact just think of anything that either has sugar added to it, or has a high natural sugar content, we don't eat it. Fruit juices for example. We used to drink quite a lot of fruit juice to the point of never thinking of starting the morning without orange juice, but no more. The 40 pounds each of us has lost and kept off says we must be doing something right. And horror of horrors, neither of us had a cold last winter even though our diet was sans all that healthy vitamin C from orange juice. It's just that we have discovered there are other ways to get those vitamins through foods that we find to be better for us. Sorry about straying from the point a little there, but back to shopping. We got all the items on our list with ease and only picked up one extra item. A package of drastically reduced chicken that Linda spied, which will make cheap crab bait. And yes I know that leaves us open to some wag who would say that's all the food at Walmart is fit for, feeding the fish, lol. On our way back we followed a brand new travel trailer for a while, then went around it before driving through the downtown area of North Bend. On the far side of North Bend, what should we come up upon, but the same trailer. There is a short cut through town we are going to find next time, smile. 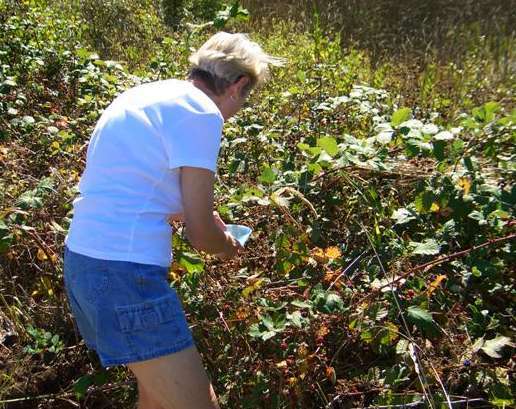 As we headed north towards Reedsport we kept our eyes open for blackberry patches and think we may have located one. That will have to be checked out some other time as we had things that needed to be in the refrigerator and it was a very warm day. 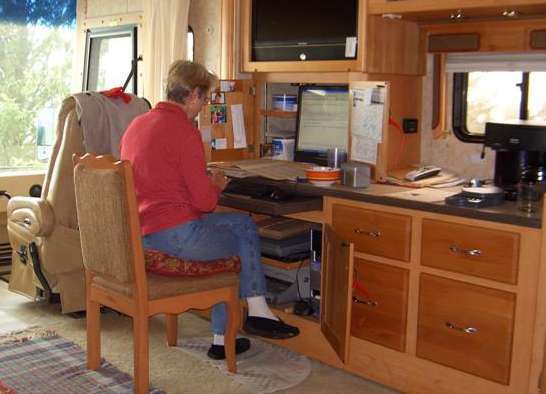 Back at the coach, Linda checked on her Ebay listings and started to get the things she had bought at the thrift stores ready for posting. She finds that about a third of the items sell for more to far more than she thought they would, a third sell for the amount she hoped to get and a third don't get any bids. Now if she would only list items that would sell in the first category, lol. Note the extreme concentration she exhibits in the photo. It's hard figuring things by pencil and paper when you're used to the computer. At the same time I was hard at work reading a few articles on the lighthouse to increase my ever burgeoning store of lighthouse lore. I now understand how a Fresnel lens works and why ours is shaped the way it is. Unfortunately it doesn't work the way I was taught on my first few learning tours, but that is okay, for from now on, all will be told right. It only took reading the same scientific treatise about ten times over the past several weeks before it finally coalesced into something my brain could comprehend. Now the real key will be to explain it to others in just a few words so they can quickly grasp the reason why the lens is shaped the way it is and why the light pattern doesn't match the color pattern of the red filter panels.See, it's even hard to explain the problem, lol. The sunset tonight was more than beautiful. The photo says it all. Dinner was barbecued pork, fresh barbecued that is, the smells of which had been driving us crazy for the past three hours. Out of the oven, I shredded it, Linda mixed a little extra barbecue sauce on it, served it with sweet potato salad and baked beans. Sure you can say we had the same food three nights in a row, but that would not be entirely correct. The salad and the beans were the same, but the pork was entirely different. This batch had a completely different taste as we had used Kraft CarbWell barbecue sauce. If sweet brown sugary sauces are your preference it isn't for you, but if you like your barbecue with a touch of vinegar tartness, this one is good and more, smile. Later Linda watched CSI Miami for the second time tonight, the joy of having the east and west coast national network feeds and then it was time for dessert. I commented that this chocolate zucchini cake was much moister than the last one. Turns out she was short of zucchini when she made the last one, but not this time. I think she has a real winner here. In parting, we have been getting a number of complimentary emails over the past few days about the new look to the website. Thanks, because that makes all the work more than worthwhile. Sept 26 Computer day today. That's what both of us plan to do But before you can have fun you've gotta eat. That's where it always seems to get good around here. Those fresh blackberries are sitting in the refrigerator so there is no suspense over what will be on the menu. One thing Linda did discover was the blackberries were just too ripe, in fact they were getting a little hairy. Hairy as in mold hairs, not a good thing for blackberries or the people who want to eat them. Not to be denied the indescribable pleasures of the plump black fruits, Linda simply lightly simmered them in a pan (after removing the hairy ones). We shall see if that solves the problem. Of course by the time she had removed all the offending hirsute berries, they were somewhat reduced in quantity. Looks like there will have to be another berry picking expedition within the next few days. For the present, we sure did enjoy our meal, smile. From that point on the day, for me, revolved around working on the website, I have so many things I want to add to it, plus it still doesn't look exactly like I want it to. When it does I will certain point out all the little tweaks I added, lol. But that wasn't what I worked on. You see I have no background in web design so everything I do is self taught. Much of today was spent looking at various websites and trying to figure out what in the world they did to get it to do what it does. The thing is, I don't view it as work or frustration, but rather as a challenge. Linda was busy doing Ebay things and had reached the point where she needed more items to sell. This made for get away time. You know, a time when she can get away from me. So, soon she was off with a, "don't expect me back to soon comment." I've learned over the years that it means don't say anything about what I bought when I get back or you'll wish you hadn't. Seeming hours later she returned to find me buried by computer problems trying to undo something on the website I shouldn't have done in the first place. It's what you call learning by error, as I just usually skip the trial part, lol. Her first comment when I didn't look up was, "see what I bought." Now those words rang like a air raid, tornado and tsunami warning siren all going off at the same time. Unfortunately she was between me and the front of the coach so flight was impossible. Conversely, in the small space we live in, she was only a few feet away from me, so staying put wasn't such a good idea either. Resigning myself to the inevitable I slowly raised my eyes. There she stood, holding a white long sleeved top up to her. It looked nice, really nice, so that's what I said. Her big smile and the comment it only cost $2.50 at the thrift store meant I had at least staved off the inevitable for the time being. It turned out that was not the case. The inevitable never happened. Good Bob, lol. Marinated in olive oil, Jack Daniels, white wine, garlic, chili powder and spices, then topped with sliced garlic and cooked covered for 90 minutes at 325 degrees, it makes for a falling of the bone aromatic and gustatory treat. 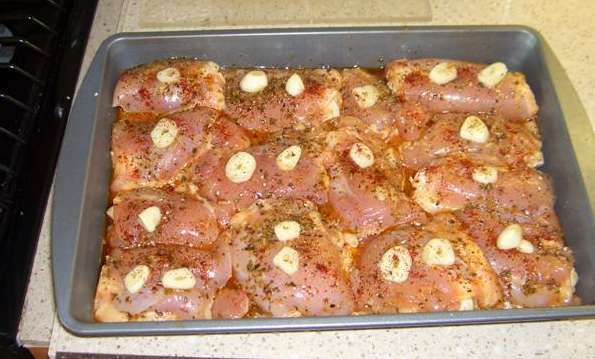 Below is a photo as it sits ready to go into the oven. The get together was great. 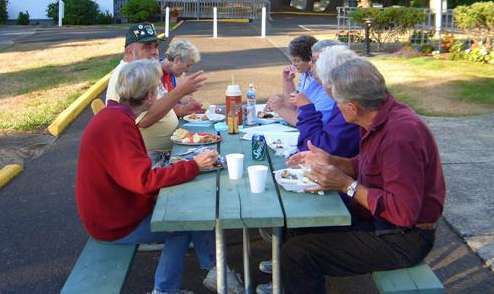 Eaten out at the picnic table in front of the museum, we had great food, great fun, great jokes and the idea to do this again in the future. I know I shall pay the price for over eating, but as the saying goes, "Every dog always eats all he can whenever he can", or something like that I think, smile. That everyone had a good time goes without saying. Note that the plate showing above Linda's hand which is piled so high to be almost overflowing, is my "second" helping, lol. Sept 27 We have no view out the front of the coach this morning. The fog has enshrouded the ocean, beach and dunes. 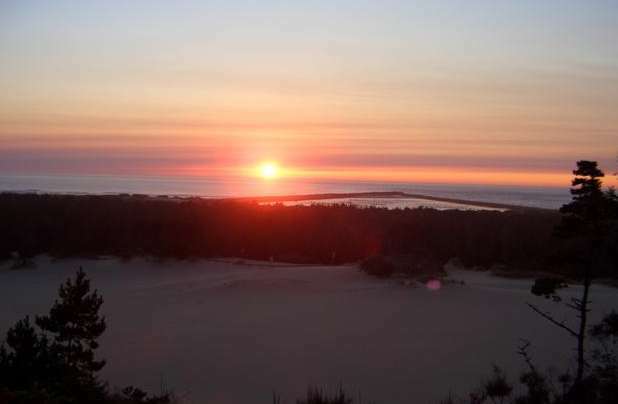 The fog and sand below us seem to meld together, with only the haziest hint of the trees on the dunes being visible. With the large tree to the right of the coach serving as a backdrop, wisps of fog blow through the air, looking for all the world like smoke from a nearby fire. I remember a similar day last year. 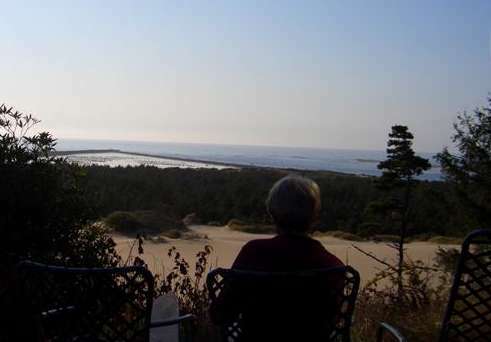 We were also on the Oregon coast, a short ways south of here. The day we wanted to visit Shore Acres State Park. The same type of dreary foggy day. We were perturbed that we couldn't see the gardens in all their glory. A year later and I sit marveling at the beauty of the same type of day. The difference a year can make. The difference perspective can make. The difference our dreams can make. It was easy to find something to do this morning, even with the fog, but unfortunately the little boy in me came out. Not good. Walking back to the table from looking out our viewless front window, I spied every little boy's delight. D-U-S-T. Nice thick dust, the kind that, when you put your finger in it, piles up like snow in front of a snowplow. So I did what all boys do. I immediately stuck my finger in it and made a design. Of course being a boy, I didn't make a straight line, or even some squiggly lines, or a pretty shape like a girl would. Of course not. I'm a boy and boys alway make the same design. The one design that positively, absolutely, most certainly will get them in trouble. I made marks that looked just like BOB. Then we wonder why we are always blamed for writing in the dust. For lands sakes, to build up that thick it must have been there for weeks, so why pick on us just because we played in it. Now,even though that dust had been on the bottom of the Euro-lounger for quite some time, why was it that when Linda came out this morning it only took her about 10 seconds to see it. After a brief discussion, a one sided conversation actually, I found myself being assigned the job of throughly dusting the entire coach. Jeesh, all I was doing was reliving a little of my childhood. So much for remembering the past only as it gives me pleasure and forgetting the rest, lol. Given a start like this to the day, it could only get better. After all isn't that how that old saying goes. With the despair only a chastised youth can comprehend, my downcast eyes looked up on one of the most shocking sights imaginable. The saying was true, for pitch darkness was staring me directly in the face. We were out of ice cream. Had she said something to me and I hadn't heard her? What if she had talked about tonight's dessert and I hadn't been paying attention. Good intentions on my part were not going to do any good. This was shaping up as the classic lose, lose proposition. Then I realized she loves eating dessert as much or more than I do. Suddenly, all was right in my world. Much of our day was spent on the computer. I was trying to get some of the posts for early in the month written, while Linda divided her time between Ebay and watching Rachel. She really loves Rachel's new show. There's just something about Rachel's enthusiasm that is so infectious. I'll admit to also being a long time fan of hers. In fact I even have a couple of pin-up pictures of her, but that's a subject for another time, lol. In the late afternoon we decided to go down to the crab pier and try our luck. As we walked out to our accustomed spot we noticed one of the locals relaxing for a moment after working to catch something for dinner. The seals are always so cute, but not if you're using fish for crab bait. To them it is a free meal and they are the master bait stealer. That's why we use the bait cage as opposed to the bait hook. Also, seals don't do chicken, though the seagull sure do. As we were setting up, we watched a gull take a piece of chicken from a open package up the dock. It was one of the early lessons we had learned. Secure your bait, both by sea and by land, lol. What followed was time spent in the most genteel manner. A time for relaxation and reading. Not that it wasn't without its finer moments. We set a new record for the smallest crab we have ever caught. Just look at the size of this fellow. How he ever managed to stay in the net without falling out I will never know, but here he is recorded for posterity. Proving to be creatures of habit, we had barbecued pork, butternut squash and baked beans for dinner, which was followed later by dessert. Linda had been thinking ahead, as the clatter of pans sometime after dinner proved. In short order there was a pot of tapioca pudding bubbling on the cook top. Talk about a good dessert. 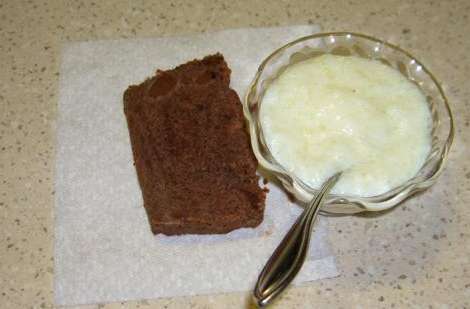 Super moist chocolate zucchini cake and a bowl of warm tapioca pudding. Healthy food and happy eaters, what a way to end the day. Before I closed the day, I took a walk up towards the lighthouse. The fog makes the light more than spectacular. Our camera does not have a setting that can take a photo of the light in all its majesty, but here is the merest hint of the beauty to be found just up the hill. Sept 28 For the second day in a row the fog has settled in along our little section of the coast. It may have settled along much more than the area in front of our coach, but since we can't see any farther than about 100 feet, we don't have a clue, smile. High humidity, low temperatures, not a day to do outside things, so there will be inside activities. While I know there will be computer time, there will also be cleaning time. At least there will be cleaning time after the other half awakes.Talk about one excited woman, Linda is really looking forward to tomorrow. That is when our Friends, Wayne and Linda will be stopping by on their way south. 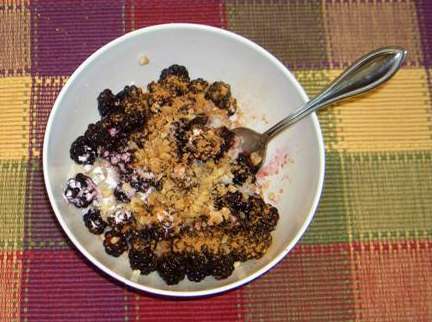 Our breakfast is once again a blend of thick oatmeal, steel cut oats and wheat bran, cooked with milk, then topped with blackberries, stevia, chopped walnuts and cinnamon. This was followed, sometime later, with the gentle shaking motion that indicates a load of laundry is in the washer. Soon the gentle shaking became somewhat more emphatic and, having learned the various oddities of that device, I deduced that a load of jeans was being laundered. Washing was one story, drying another. To dry 4 pairs of jeans in our little dryer takes more than just a little while, but Linda has learned a few things over the past months. Twenty minutes or so of tumbling in the dryer to get the wrinkles out and up on a hanger you go. 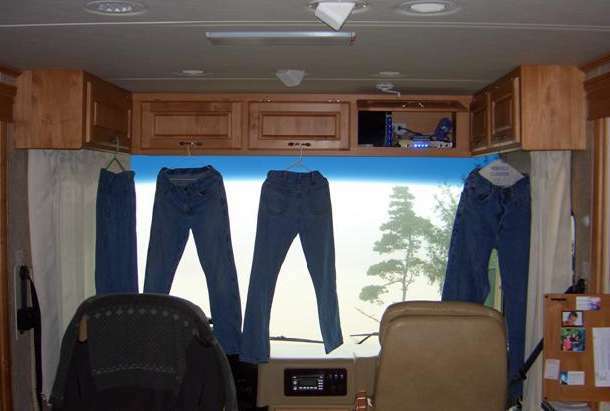 With the fog in, there was no view to the front, so she hung the jeans from the overhead cabinet handles. Rather ingenious I would say. Normally we wouldn't have 4 pairs of jeans to wash at once, only one or two pairs, which, Linda says, is the better way to do it. 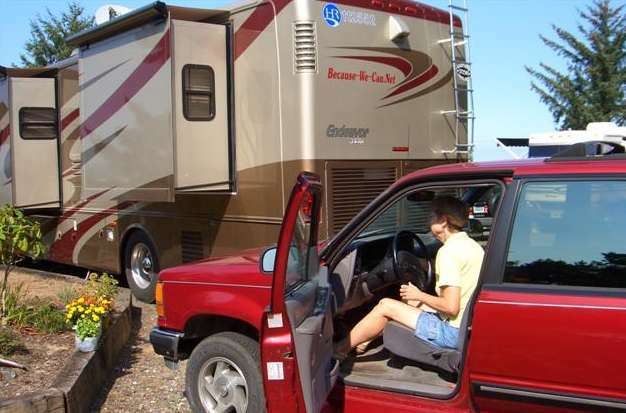 We like to follow the adventures of others who live in their RV, just as we do, but what we find is that some of them seem to be on one wild rush, rush vacation. While we certainly visit attractions, that is just not our way of living. I don't think there is any magic wand that is waved which changes them into something new when a person embarks upon this life. I know there are many exceptions, as everyone has their own approach to life, but we left the stress of work in order to live a long, satisfying life. Why substitute one form of stress with another, so we just kick back so to speak, and enjoy what we have and what is presented to us. Don't mean to pontificate, but we had just read a journal where they had been rushing around all day seeing things, and in fact, arrived at their last stop shortly before closing time and hence had to rush through it. Then they were lamenting that they were tired, stressed and disappointed in not getting to spend enough time at the last facility, and these people are full timers. Is it any wonder so many people either burn them selves out, or simply run out of money in a few years and decide it is time to "really retire" and so leave the life on the road. Our day was about as mundane as could be. 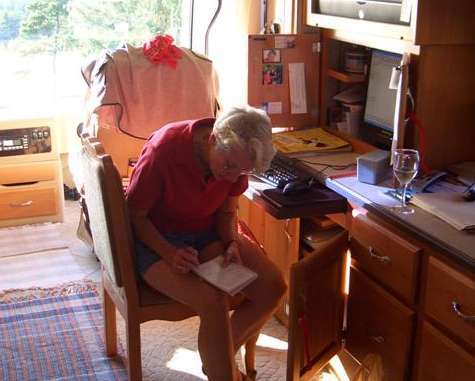 We spent time on the computers, of course, then we cleaned the coach and finally went over to Reedsport to get a few groceries. 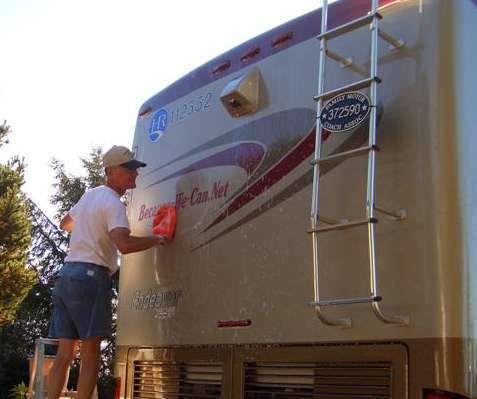 Linda's comment when we were cleaning the coach made my day, as she laughingly joked, "we can clean the entire coach in just about a half an hour, what's not to love about this life." Which after a little thought was followed by, "of course, if we open the windows it only takes 5 minutes to get it all dusty again." We laughed and laughed, because we realized, who cares, lol. 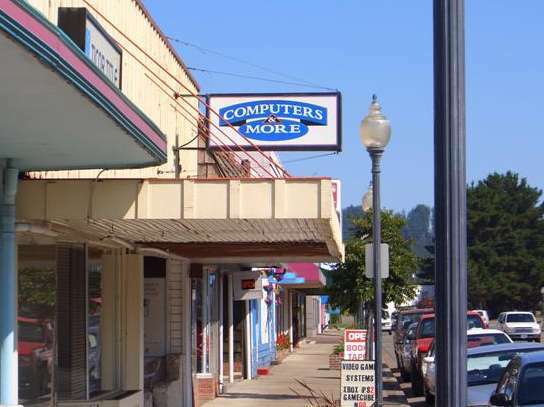 Our trip to Reedsport included a stop at the computer store. Talk about naive, we forgot this is small town America. Fruitless visits to four stores as we cruise we streets of town looking for a store that actually sells things for computers, before we find it tucked in among the buildings of old downtown Reedsport. Just in case anyone ever wants to know, Linda took a photo of the store's sign to document it's existence. The reason for the computer store search was to replace my mouse that died. Later, having found out I had bought the wrong mouse, I switched the location of the USB unit and the old one worked as good as new. Some days...... Food put away, coach cleaned, we undertook the the final job on Linda's list, dumping our gray and black water tanks. This entailed more than just putting the hose in the sewer and hitting the switch to pump the gunk. When we had turned the coach around to face the ocean we had also put the sanitary bay on the corner opposite from where the sewer is located. That was why we had purchased 60 feet of bright yellow garden hose, and 2 fittings so we could make it into two 30 foot pieces, a task that was quickly accomplished. Talk about easy. Now it was just a matter of waiting for the pump to do it's work. 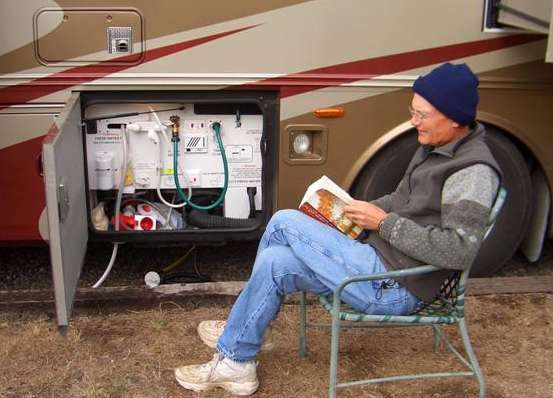 Notice the Assistant Sanitary Engineer in the photo below looking at the operating manual Linda gave him to read. Okay. okay, maybe it was a book on 18th and 19th century great works of literature, but based on all the instructions she gave me, it seemed like the manual had to be at least that large, smile. Dinner was a pot of crab bisque with a side of corn bread. There was also some serious TV watching. Since we get both the east and west coast network feeds we can watch 6 hours of prime time TV in a day if we want, lol. Let's say we had more than our share tonight, but what the heck, it's the new season and some of the shows are great. We especially enjoyed Ugly Betty and as always, Grey's Anatomy was as good as TV gets. Dessert was a replay of last night, warm tapioca and cake. Then it was off to rest up, for tomorrow we shall go back to work, if you can call it that. I call it sheer pleasure. May your work be as much fun as ours.To know the link with the past. To experience the connection of being human. The joy of life. The spirit of individuality. The adventure goes on and on. Sept 29 This morning was a repetition of the last two, no view to the front, as the fog continued to nestle up against against Umpqua Head and obscure our view of the ocean.However, looking out the front of the coach was not the real reason to consider what impact the fog would have on our day. Rather it was, what impact would the fog have on visitors to the lighthouse, for we are returning to our volunteer activities today. Thinking about what we do, the word word just does not seem to correctly convey how we feel about what we do. What we did during our stint at the campground in North Carolina this spring was work, some of it very, very arduous physical labor. What we do here is entirely different and it is what makes volunteering what it is. There is something for every ability or desire, whether, physical, mental or emotional. Getting ready for the day required clearing the cobwebs, or using a term better fitting the morning, clearing the fog from my mind. While Linda chooses coffee in the morning, I am tea drinker and a fresh brewed cup of Cherry Bancha had just the little lift I was looking for. One of my goals for the day was to have the daily journal posted by 9 AM this morning. This may sound simple but my past history would indicate otherwise, since I would often spend four or more hours working on the journal to get it the way I wanted it. Linda tells me I've come a long way just to get it done every day before noon. I was a little off on my time estimate, but still, it was finished and uploaded to the server before we walked over to the museum shortly before 10. Linda's comment of, "I didn't think you'd get it done'" made me feel great, as I wasn't sure I was going to either. I guess that was the Bob's version of, Aim for the eagle, hit the ground, Aim for the moon, hit the eagle. Breakfast was the last of our blackberries, served over a bowl of hot steaming oatmeal, which tasted just as good after having it five mornings in a row, as it did Monday, the first morning we had it. Working on the journal had made the time before we had to open up the museum to pass very quickly. 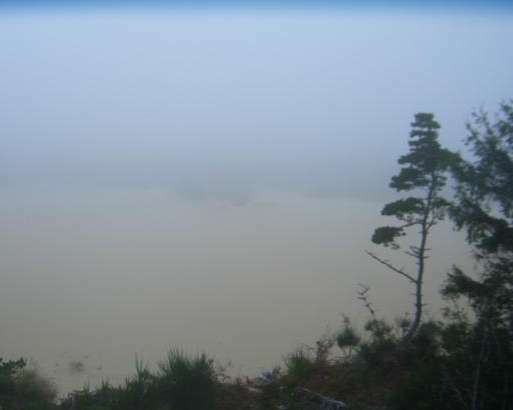 By 10 o'clock the fog had not lifted at all, in fact it may have been thicker than it had been several hours earlier. I wasn't the best judge of that, because several hours earlier my attention had been focused solely on the computer screen as the yesterday's journal appeared one word at a time, smile. 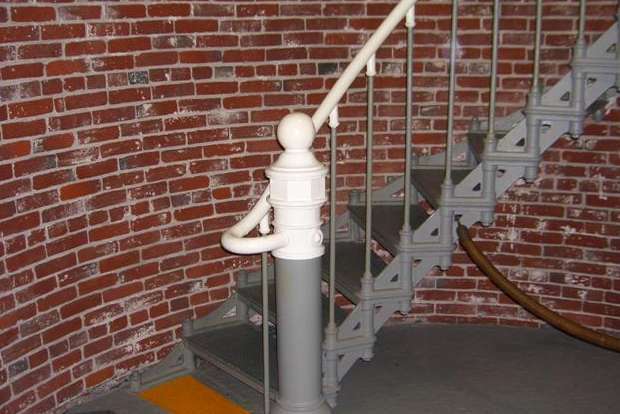 As usual, while Linda prepared the museum, I took the lighthouse key and sign and started the walk to the top. 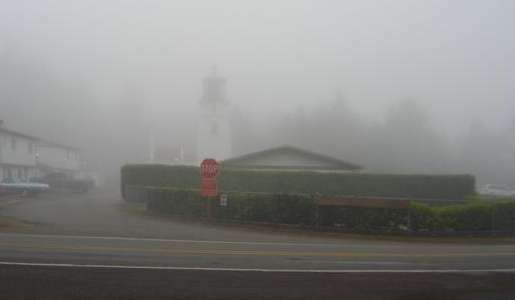 It was most definitely a foggy morning as this photo, taken from the top of the museum parking lot looking south towards the lighthouse shows. The lighthouse is directly above the red stop sign. Once inside the lighthouse the view was the same today as yesterday and all of my yesterdays. It is no wonder it was featured in an article in the October issue of Sunset magazine. Walking through the short passageway that leads from the workroom to the base of the tower, that sense of being in an another time and place swept over me. In front of me was that solid, sturdy sculptured 114 year old curving cast iron set of stairs that led to the top of my world. The day passed quickly, though we were afforded one break in the late afternoon when things slowed down. However, the last tour of the day left right a 4 o'clock, and had a very serious photographer and student of lighthouses on it. It was about 5:15 until were finished. I didn't look at the lateness of the hour as bad, to the contrary, it was good. You see, people like this can ask very challenging questions, questions I readily admit I don't have the answer to. But then it gives me something to research and dig into, a quest to find out the answer and add to my store of knowledge. What's not to love about what we do, lol. Down at the museum I found that our friends, Wayne and Linda, had arrived and were being given a personal tour of the museum's second floor. Soon we were off to Sportsmen's Cannery and Smokehouse to buy some fresh tuna for dinner. Back at the coach, we gave them a tour, then we talked up a storm as Linda started preparing dinner. 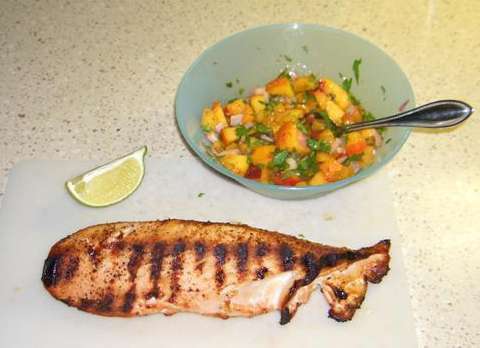 The Baby Que gave the tuna those perfect grill marks that complement and add to the enjoyment the grilling imparts. Served with a lime peach salsa, tossed salad and steamed broccoli, it was a fabulous feast. Later we sat at the table as Linda served pumpkin fluff (this one is definitely a keeper) and coffee. Just to add a little extra to the Hazelnut coffee, she gave us the choice of adding stevia, French Vanilla Torani and/or whipped topping to the coffee. Going for the whole nine yards, I added everything to mine. Even had a second cup. Good friends and good food, life lived to its fullest. To know the link with the past. To experience the human spirit. The joy of life. The connection of togetherness. The adventure goes on and on. 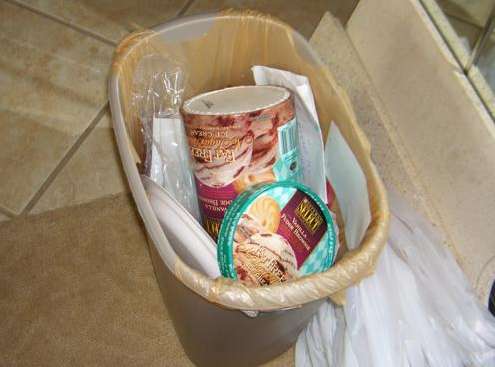 Later, after saying goodbye to Linda, Wayne and their two dogs, Freckles & Pepper, we watched some TV, then, just before calling it a night, had another serving of pumpkin fluff. Yes it is that good, lol. By the way, just to put things in perspective, I had eaten the last of pumpkin pie from the pot luck at noon, so it may be that I will wake up tomorrow looking like a giant orange pumpkin, lol. Sept 30 What a wonderful view to wake up to this morning, the fog was clearing. We could actually see the point of the triangle. I have recovered nicely from the hectic nature of our first day of conducting tours after having six days off. I can also report that I did not wake up looking like a giant orange pumpkin, even after my pumpkin binge of yesterday, lol. Right straight off I tackled the daily journal. The more I write the easier it seems to flow from my pen. 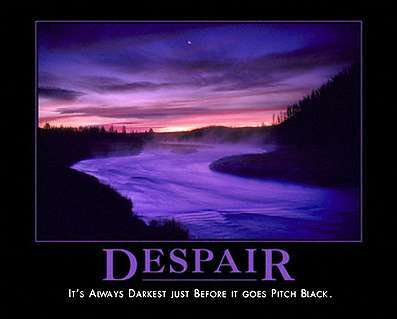 Excuse the use of an improper and out dated metaphor but, flows from my keys, just doesn't seem to cut it, smile. Once again I did not meet my goal of having the journal finished by 9:00. However, at 9:20 Linda was taking her turn editing it, so I am edging closer to my goal. I wasn't sure what Linda would be fixing for breakfast since we had eaten the last of the blackberries yesterday, but I shouldn't have worried, it was our oatmeal blend served over sliced fresh peaches. Almost before we knew it, the time had come to walk over to the museum and start our day. This looked like it might be a good day. Even before we were open our first visitors were at the door trying to get in. The museum is a neat place that we don't get to spend enough time exploring all of the exhibits. Today was shaping up to be another of those non-stop tour days, which is good, as the day just seems to fly by. Linda and I have never been ones to enjoy a sit around job, we want to be busy and it sure looked like it was going to be that way from the way it was starting. As is my daily routine when we are giving tours, I head up to the lighthouse. The scene that greeted my eyes was certainly not what I am accustomed to. There were hogs everywhere, big, loud noisy hogs. Just look at the pictures below. Maybe I should say I only thought I saw some hogs. Up by the lighthouse the hog pen was full, so to speak, lol. 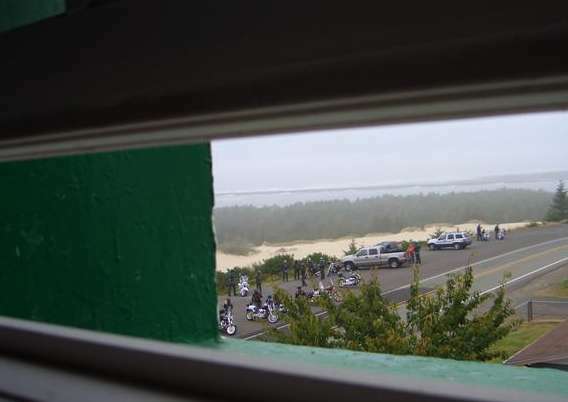 What was happen was a Harley Rally, and the check-in point was our upper parking lot across from the lighthouse. 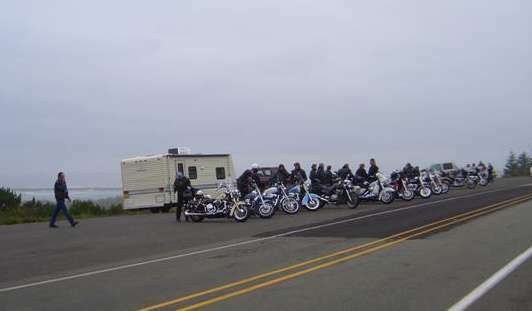 Let me tell you, when all these Harley's fired up and pulled out, it was so awesome the hairs on my arms were even standing at attention. The view from inside the lighthouse was rather unique. I wonder what the light keeper who was descending these stairs a late September morning in 1896 would have thought if he would have looked out on a site like this. Down at the museum I found that Linda had already organized the first tour. It was a different day to say the least. We were inundated with lighthouse nuts, as they liked to refer to themselves. Part of the reason is over the confusion regarding the date the lighthouse closes for the season. At one time museum and lighthouse tours were shut down at the end of September, but had changed to an October 30th closing date.The problem is, a lot of printed literature and websites still list September 30th as the closing date.The "Nuts" were trying to get in their visit before the light closed. What it did was make for a great day to give tours. Sharp, smart people with good questions and an eye for details. I think I learned about as much today as I imparted. Linda commented she had a number of people remark how good the tour had been. That's all the pay I need, lol. The day went by so fast that I didn't even remember to eat. Not a problem as I devoured my turkey wrap as we walked over to the coach, then sat with Linda and enjoyed the view of the ocean as we ate our peanuts. Linda was a little miffed that we couldn't have had this weather last night when our friends, Wayne and Linda had been here, but it is not meant to be so. Dinner was similar to last night. We both work hard so why not relax when it comes to cooking for a change. 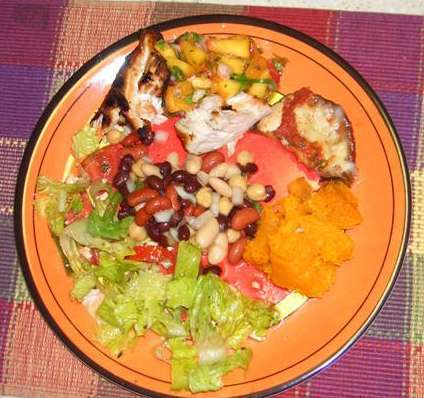 Grilled Tuna and peach salsa, tossed salad, baked butternut squash , three bean salad and eggplant Parmesan. Is that an eclectic meal or not, lol. Linda made an interesting observation about the appearance of the grilled tuna, The fillet actually has the same shape as a fish. What do you think? Later we watched Iron Chef America and tried to make room for dessert. It was going to be butterscotch pudding, Linda didn't take to kindly about my comment about her continuing the pumpkin theme, if only in color, so she made a no bake oatmeal chocolate cookie instead. Our day was awesome. I hope yours was too.